a hierarchal autonomous system framework that will depend on deterministic systems with higher authority to protect against catastrophic piloting faults and allow a lower level certification for the machine learning sub-systems. The multi-layered approach provides the framework for analytical systems that can learn, predict, and adapt to both routine and emergency situations. Work to date: The hierarchical decision chain and framework, hardware, and embedded processing related to ground collision avoidance is in place for a sub-scale platform. Flight tests on a quad-rotor model helicopter demonstrated successful limitation of flight decisions when facing imminent ground collision. Looking ahead: The team is developing a full set of safety-critical functions for the sub-scale platforms and working to scale up to larger UAVs. 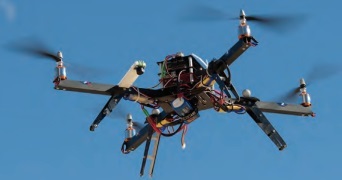 Partners: University of California at Berkeley and Stanford University are developing algorithms, and the FAA is participating in the certification process. Increases safety: Integration of safety-critical functions improves outcomes in emergency situations. Certifiable: Removal of safety-critical functions from the autonomous control enables adaptable processes to be certified to a lower level. Researchers at Armstrong are dramatically improving upon existing ground collision avoidance technology for aircraft. Controlled flight into terrain remains a leading cause of fatalities in aviation, resulting in roughly 100 deaths each year in the United States alone. Although warning systems have virtually eliminated this problem for large commercial air carriers, the problem still remains for fighter aircraft, helicopters, and general aviation. Armstrong innovators have been working with the U.S. Air Force for more than 25 years to develop automatic col-lision avoidance technologies for fighter aircraft that would reduce the risk of ground collisions, the leading cause of fatalities in both military and general aviation. The result of the collaboration is lifesaving technology that incorporates onboard digital terrain mapping data with data-adaptive algorithms that predict impending ground collisions.